Editor’s note: This is the final post in a four-part series about the new Evangelical Lutheran School of Hope in Ramallah. Catching up? Read parts one, two, and three. 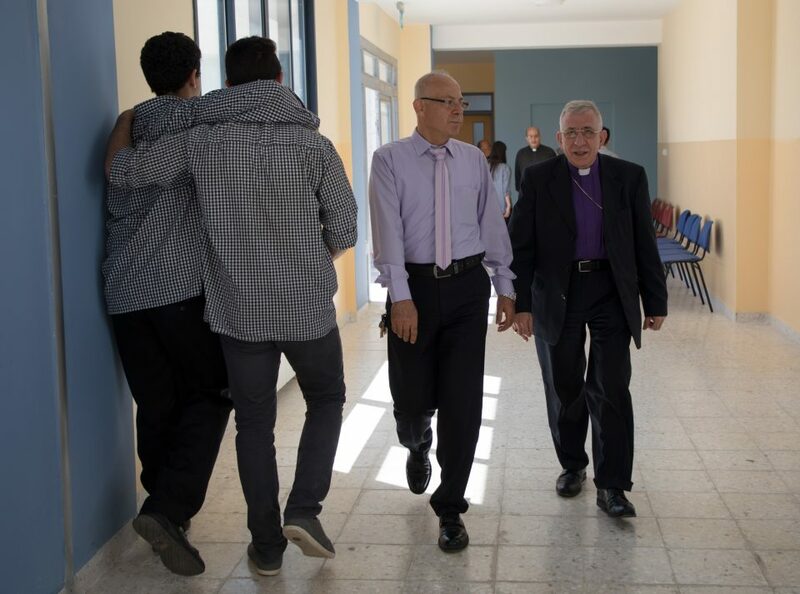 Two weeks before the opening of the new campus for the Evangelical Lutheran School of Hope in Ramallah, the local Evangelical Lutheran Schools (ELS) network welcomed a new principal and deputy principal to the school and gave homage to the dedication of its retiring principal. Michael Abu Ghazaleh retired after serving as principal of Hope for 29 years and as a teacher at ELS for six years. Under his tenure as principal, Hope graduated 29 groups of students and maintained a high standard of exit exam results. He was also instrumental in establishing the school’s Dabke Dance Troupe and encouraged the growth of its cultural exchange program. His successor is Naseef Muallem a former journalist and teacher at Hope who was serving as the head of the Palestinian Center for Peace and Democracy. The morning the school opened, he greeted students to the new building with a pep talk and, with his deputy principal Mays Husary, distributed small gifts of coloring books and colored pencils to the new students in first grade and kindergarten. The ELCA has a presence in this school through its Young Adults in Global Mission program in Jerusalem and the West Bank. ELCA volunteers will work closely with the new administration to accompany students as they begin the new school year. When asked what he and Husary have planned, Muallem outlined a methodology for learning that is based on the educational philosophy of Paulo Freire, whose method of education makes the teacher and pupils co-learners and other students co-teachers in education. “We are looking to build on what has already been done here while introducing these new techniques that reflect the philosophy of the Evangelical Lutheran Schools,” he said. Leading up to the opening of school, Muallem lamented the number of families he has had to turn away. “Families that live close to the school have come to the school asking to register their children, but I have had to say ‘no,’ ” he said. While the school is a vast improvement for the current student body, plans to expand the building have been drawn into the original architectural blueprints so more students can attend. The school is opening at capacity, but there isn’t room this school year to accommodate new registrations until any expansion begins. The administration at least has space to dream and the land to expand the campus in the future, something that wasn’t possible with the old building. Although Tala, an 11th-grader at Hope, was reminiscent about the memories she had made on the old campus, she welcomes the new school, especially for younger students who have a chance to spend their entire school career there. Their education will be different. Hope teachers and staff say they are hopeful that the freedom of space, safety and access to newly equipped classrooms—including three laboratories; designated music, arts and language rooms; conference rooms; and a large library—which will inspire the students to apply themselves and reach for greatness. Although Tala, an 11th-grader at Hope, was reminiscent about the memories she had made on the old campus, she welcomes the new school, especially for younger students who have a chance to spend their entire school career there. Their education will be different. “This is a new start. When you have been waiting for something and it comes, it is exciting,” she said.